BUSHFIRES have devastated communities across Victoria and NSW, with over 80 homes believed to be destroyed. Hundreds of firefighters will tackle bush and grass blazes in Victoria's southwest today, after homes and farm buildings were engulfed in flames over the weekend. Victorians ran for their lives as the biggest fires of the season destroyed at least 18 homes and left livestock dead across the state's southwest. 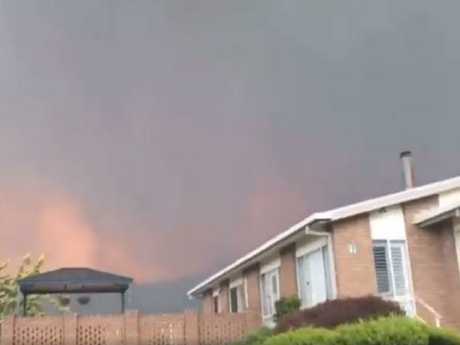 Vic Emergency has issued a warning this morning for the areas around Camperdown, Terang, Cobden and Hawkesdale, which were some of the worst-hit areas over the weekend. Around a dozen homes were destroyed by fires across the state and hundreds of beef and dairy cattle killed. 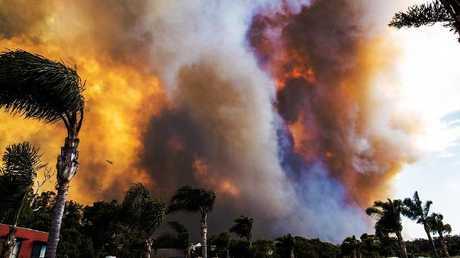 40,000ha were burnt out and hundreds of people were evacuated, the Herald Sun reported. 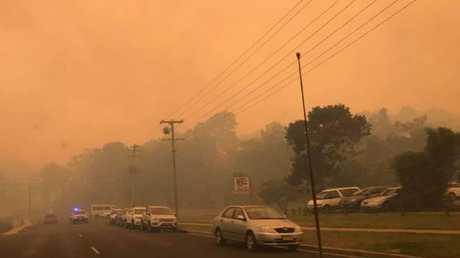 Meanwhile, up to 70 homes and a school are believed to have been lost in a disastrous bushfire that enveloped the NSW south-coast town of Tathra. Tathra locals have gathered overnight in an evacuation centre, not knowing what will be left for them in the morning. Observing an aerial monitor of the wreckage this morning, Tathra locals Bev and Val told Sunrise they believed their house had been destroyed. "I got evacuated three times," said Val. "I got told to leave Thompson's... went to a friend on the street in Tathra, got told to leave there... went down to the beach and got told to come here." "It's very strange," said Bev. "It doesn't seem real just yet. 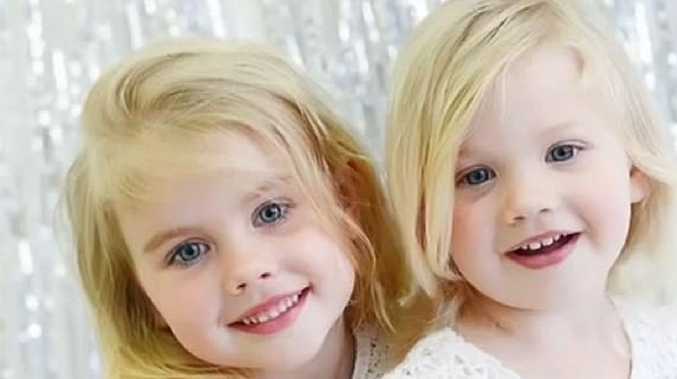 "It probably would have helped if we had mobile phone coverage," she added. "But apparently we don't deserve mobile phone coverage." The threat was downgraded late last night, but the impact has been devastating. 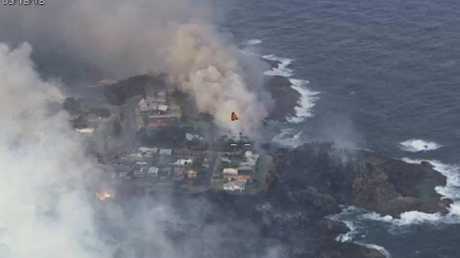 Caretaker Peter Coulton told The Daily Telegraph the evacuation centre was "completely packed". "They're all in tears, they have lost everything," he said. Insurers have declared the event a "catastrophe", The Daily Telegraph reported. So far there have been no reports of any people injured or killed in the out-of-control bushfires. "We are hearing several dozen properties (have been lost in Tathra)," Insurance Council of Australia's communications director Campbell Fuller said. "Because a catastrophe had been declared it ensures prioritised claims from losses caused by these bushfires and those claims are also triaged so those with the most need received the promptest attention." 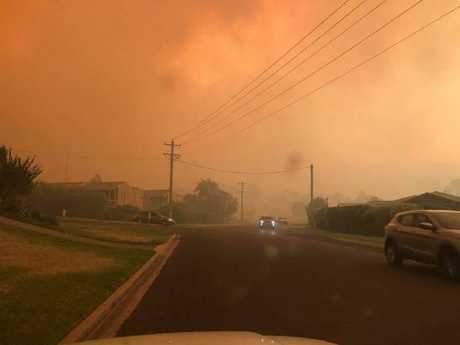 Residents in the NSW seaside town of Tathra were told it's too late to leave as an out-of-control bushfire encroaches on homes. It's now feared up to 70 homes, including a popular caravan park, were damaged or destroyed by the blaze. The NSW Rural Fire Service on Sunday afternoon issued an emergency warning after the fire crossed the Bega River in the state's southeast and headed towards properties around Thompson Drive. Resident David Porter posted this image to Facebook saying he had ‘never felt so helpless’ seeing his street engulfed in smoke and flames. 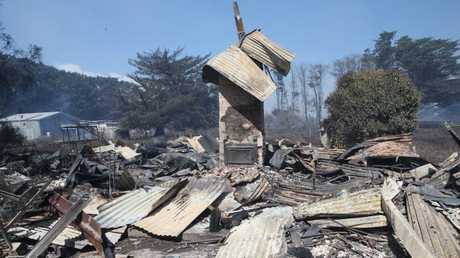 The fire - which started in Tarraganga, southwest of Bega - was being fanned by strong and gusty north-westerly winds. But a southerly change is expected to hit the area later in the afternoon which may push the fire in a different direction, the RFS says. 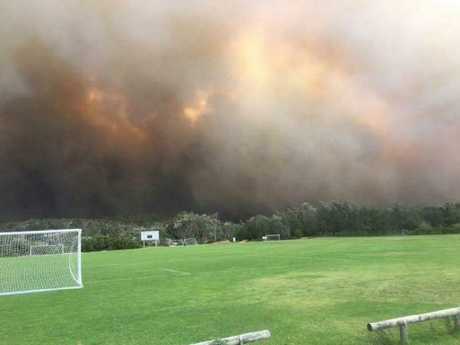 "If you are in Tathra, seek shelter if the fire impacts. It is too late to leave. Protect yourself from the heat of the fire." A watch and act alert has also been issued for another fire near Kerrisons Lane and Northview Close at Bega. An alert is in place for a fire near Goulburn, northeast of Canberra. The fire is burning in the area around Tarlo River Road, Carters Close, Towrang Road and Narelle Lane in Greenwich Park. Firefighters are gaining the upper hand and conditions are easing, but those in the area are being advised to have a plan ready in case the blaze does impact their property. Total fire bans were issued for more than half of NSW on Sunday including the Greater Sydney region given the hot and windy conditions. Twelve of the state's 21 regions are experiencing severe fire conditions. A house has been burnt down south of Cobden as bushfires burn in the state's south west. Assessment teams are due to arrive in the area today to inspect properties and confirm the damage. Temperatures soared to 38C at 3pm in Sydney's CBD while further west at Penrith they reached 38.2C. In Bega the mercury hit 38.4C at 3pm, while at Goulburn it was slightly cooler at 33C. Victorian fire crews say strong winds, forecast to shift from south-easterly to westerly this afternoon, will put the fire fronts on a collision course to form a super blaze. "Conditions are making the effort difficult where we now have to fight the fires on multiple fronts," Senior station officer Peter Lowe told The Herald Sun. The towns of Camperdown, Cobden and Timboon remain under fire threat. Emergency warnings were issued this morning for about 50 towns between Hamilton and Port Campbell, across an area of more than 160km. Authorities say 10 to 12 homes have been lost in west Cobden, but the exact number remains unclear. And they fear there may be more. Hundreds of beef and dairy cattle have perished in the blazes, which have blitzed through 40,000 hectares. Almost 300 firefighters are battling the blazes, with 29 aircraft also deployed to help out. Emergency Management Commissioner Craig Lapsley says firefighters are doing an exceptional job on the ground and in the air. amid fears of worsening weather conditions. An image from the NSW RFS Facebook page. "We could see dry lightning and thunderstorms ... across Victoria (this afternoon)," he said. Strong winds continue throughout Victoria, and the erratic weather could start more fires, or make the firefighting effort more difficult. "We're outside summer and we're going into a summer-type bushfire scenario for two days," Lapsley said. It's believed lightning strikes could have started some of the blazes, and could spark more. And 22,000 properties are without power across the state, due mainly to strong winds bringing lines down. There are four major fires burning, the worst being a huge blaze at Terang, which is threatening the town of Cobden. The Terang fire, which has so far burnt through 12,000 hectares, is moving in a south-easterly direction towards Timboon. The Camperdown (Gnotuk) fire is also moving in a south-easterly direction, heading towards Pomborneit. There is also a fire at Garvoc, which has so far burnt through 5000 hectares. It's feared that cluster of fires could become one, fanned by strong winds, gusting at around 100km/h. "We're certainly not out of it. We've still got a lot of strong wind," Mr Lapsley said. "It's not the hottest day but it's certainly one of the windiest." "Traditionally in Victoria, in that sort of country, we lose more ground after the wind change than before." That change may push the Terang fire towards the western foothills of the Otway Ranges. Paramedics have helped dozens of people, some with breathing difficulties. Authorities are asking locals to stay tuned to emergency messages and act when required. Relief centres have also been set up at Warnambool, Hamilton, Colac, Camperdown, Port Campbell and Cobden. Corangamite Shire Mayor Jo Beard, which covers Cobden, told 774 ABC Melbourne that the fires took them by surprise and that a lot of houses and sheds had been lost. She had heard stories that people had to "hunker down in dairies" to escape the fire. Firefighters battling the fires through the night were unable to save a power substation at Terang on Saturday night. A number of roads have been closed, including the Princes Highway between Camperdown and Panmure. Total fire bans have been declared for the Central and South West districts. Strong winds are expected to pass through Melbourne on Sunday, reaching the state's far east by the early afternoon. "From from that point onwards we will basically see temperatures drop quite a bit as well," the weather bureau's senior forecaster Chris Godfred said. Premier Daniel Andrews said he was thinking of those affected and commended firefighters and emergency crews on their efforts. "The greatest challenge in terms of firefighting is to have a significant fire that runs hard throughout the night," Mr Andrews told reporters on Sunday. "That's exactly what's occurred in these locations overnight." Elle Moyle was hosting a wedding at her property at Gazette, north of Warrnambool, when the fire came incredibly close on Saturday night. "Then it was licking at the door very quickly," she told ABC radio. "We were actually unfortunately hosting a wedding on our property, so we had to evacuate 150 people, which was a bit scary."